A radioactive seed on a fingertip. The use of implanted radioactive seeds (brachytherapy) has proven to be very effective for early stageprostate cancer. This minimally invasive procedure targets the tumor while preserving the healthy tissue surrounding it. Patients typically experience fewer side effects than other prostate cancer treatments and can return to normal activities within two to three days. The physicians of Alliance Urology Specialists have played a crucial role in bringing this innovative and effective treatment to patients in this region. In 1993, Alliance Urology Specialists urologist Ronald Davis, M.D., and radiation oncologist Nigel Goodchild, M.D., performed the first prostate seed implantation in North Carolina. At that time, the procedure was so new that coding for it was unknown, so Dr. Goodchild purchased the equipment out of his own pocket and the two physicians began performing prostate seed implants for patients from across the United States. Since that time, physicians at Alliance Urology Specialists and Moses Cone Regional Cancer Center Radiation Oncology have jointly performed approximately 1,800 seed implant procedures. Candidates for prostate seed implantation typically have a Gleason score less than a seven, PSA ten or less, and a prostate volume of 60cc or less. The procedure is performed using general anesthesia and usually takes about two hours. A catheter is inserted into the bladder and a transrectal ultrasound (TRUS) is used to guide placement of the seeds in the prostate gland. A pelvic X-ray showing seeds in the prostate. With the use of a TRUS, three-dimensional images are obtained and a radiation oncologist plans the optimal pattern of seed placement. A needle guidance template is fixed to the ultrasound unit and the urologist carefully pushes needles through the skin into the prostate. 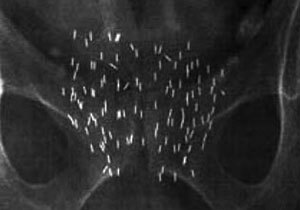 Through these needles, rice-sized radioactive seeds are inserted and an innovative system automatically implants the seeds into the prostate. The number of seeds and needles varies depending on the prescribed treatment. Once all seeds have been placed into the prostate, the needles are removed, the treated area is dressed, and the patient is moved to the recovery area. The seeds are permanent and the radiation dose is delivered gradually over a period of time. Follow-up care is required to monitor progress. Possible side effects of prostate seed implantation include sexual dysfunction, rectal problems, and urinary incontinence. In less than 1 out of 600 patients, severe rectal complications occur. For more information about prostate seed implantation, call 336-274-1114.